This carefree groundcover shrub produces masses of brilliant, scarlet red flowers spring through fall, providing color for up to ten months in warmer climates. 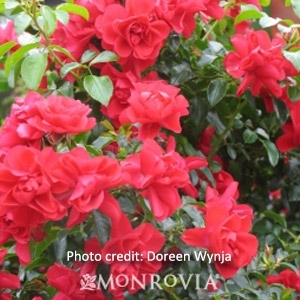 Its glossy, dark green foliage is resistant to mildew and black spot. Highly adaptable and tolerant of dry conditions once established. An excellent choice for borders, pots, and hanging baskets. Deciduous. 2-gallon. 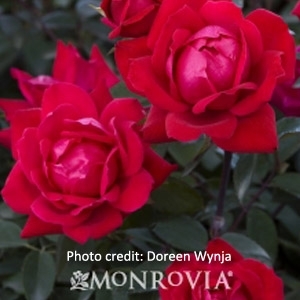 A maintenance free rose that continually produces self-cleaning double candy apple red flowers with a slight spicy fragrance. Unsurpassed resistance to black spot and downy mildew leaf diseases. An excellent low hedge or accent. Deciduous. 5-gallon.